Tuesday morning at Our Forever House is ALWAYS and exciting time. At roughly 6:45am, my son's ears perk up and he gets uber excited. Running to the door, he can't wait to stand in the driveway to watch as the recycle truck empties the cul-de-sac's recycle bins. This week was especially exciting because the driver honked his horn when he saw the kids standing there watching in their jammies! 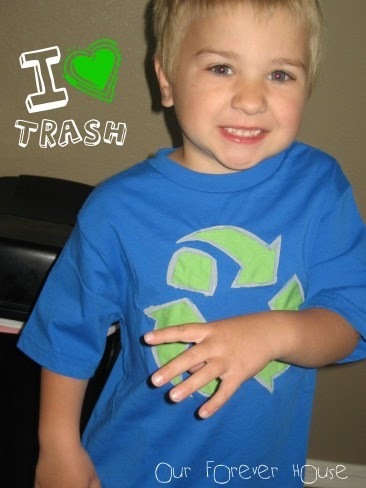 His excitement for all things recycling and trash are endless. He tells me during car rides that seeing and counting trash cans and garbage trucks gives him super powers - he is a garbage superhero! I, of course, love this obsession and will continue to encourage it in any way that I can! That is where this week's t-shirt project comes in ... a painted reverse applique t-shirt. As mentioned yesterday, I am on a mission to make some fun graphic t-shirts for my kids since I did not like the mature content available in the "big boys" section of many of the stores. 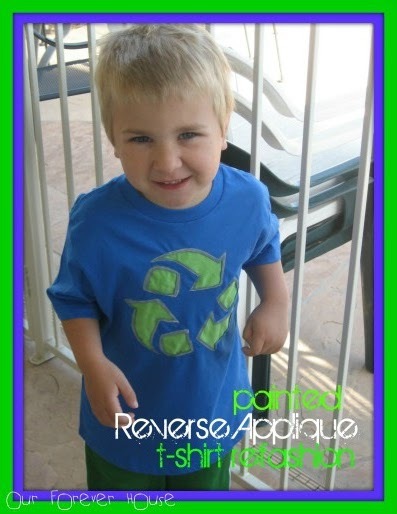 My son is 5 and I want him to wear age appropriate clothing. Plus, I want his shirts to be fun and reflect who he is and what he loves. This was a fun project for me because I got to try a couple of techniques I have never done before. 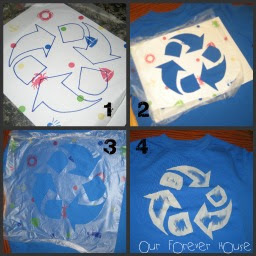 The first was using Glad Press N Seal as a stencil and the second was reverse applique. #1: Fully cover the graphic with Glad Press N Seal. Mine was a summer themed from my amazing Target summer clearance haul from last year. Make sure the Press N Seal is smooth and secure. #2: Cut out the graphic being sure to create a clean edge on the Press N Seal. 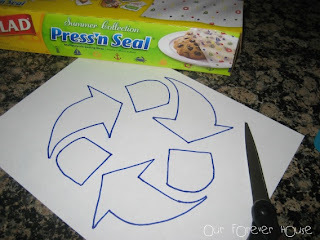 #3: Carefully remove the paper backing and place the Press N Seal design on your t-shirt, making sure to keep the plastic smooth and not stretch the design. Also make sure the graphic is centered. I had to reposition mine and it was difficult to pull the Press N Seal off the fabric without ripping it. Smooth the edges around the design real well to make sure it is prepped for painting. #4: Paint over the image and remove the Press N Seal. When painting, make sure to place a board or piece of heavy paper inside the shirt so that the paint doesn't seep through. Since I was doing a reverse applique I only needed to do the edges as the center was going to be cut away. Let the paint dry thoroughly before proceeding. 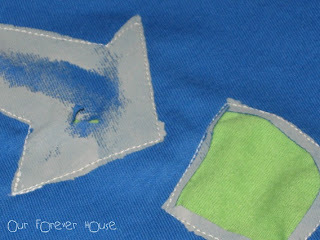 The next step is the reverse applique portion of the shirt. Cut a piece of fabric a bit larger than your design and pin it behind the design on the inside of the shirt. In the inspiration, she hand stitched around the design but I decided to machine sew mine. After hand sewing the pom-poms t-shirt yesterday, my hand was far to soar. I sewed along the edge of my paint. I then separated the two layers and clipped a small hole in the t-shirt in order to trim the INSIDE of the applique area in order to expose the back fabric. Additionally, I flipped the shirt inside out and clipped the green fabric around the OUTSIDE of the design. I used t-shirt fabric so the edges will not fray and will be soft to the feel which is important in kids clothing (mine too for that matter). I love how the paint frames the reverse applique fabric and gives an added dimension to the design! My little man could not wait to wear his new shirt! 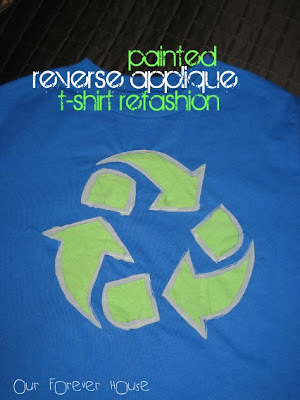 Come back tomorrow when I share yet another t-shirt re-fashion project.